I had only heard about this book thanks to the movie. No, I haven't watched the movie as yet, but I know that Johnny Depp looks like a dream in it. After having read only thrillers for a while, I grabbed the opportunity when a friend suggested that I read this book. An order was placed and soon I received the book. The cover looked delicious and tempting. But I had to wait for a while before starting to read this one as I was caught up with some personal emergencies. But then one fine day, I opened it. Vianne Rocher, an exotic stranger comes to the French village of Lansquenet and opens a chocolate boutique 'La Celeste Praline' right opposite the church head by Father Francis Reynaud. It is also the beginning of Lent, the traditional season of self denial where one is expected to curb all temptation. Father Reynaud hates her from the first sight. More so because she's an unwed mother to six year old Anouk. When Vianne's chocolate cafe begins to do really well, Reynaud is not happy. Much to his chagrin Vianne announces a 'Easter Chocolate Festival' for Easter and gets ample support in return. This along with Vianne's penchant for making easy friends, angers Reynaud who makes it his sole mission to destroy Vianne and her chocolate shop, especially since he considers chocolate to be the ultimate sin. Who will win this battle? Especially when each holds secrets of their own. While most of the story revolves around Vianne and Reynaud, there are ample supporting characters as well. Armande Voizin, the friendly diabetic who befriends Vianne in an instant is my favorite. She hates her daughter and her son-in-law but yearns for her grandson, Luc. Vianne helps Armande and Luc meet secretly at her cafe thus establishing a relationship between grandmother and grandson. Then there is Josephine Muscat who is abused by her husband on a regular basis. When Vianne motivates her to do something about it, she leaves her husband and moves in with Vianne helping her with the cafe. Suddenly more people begin to open up to each other and Armande credits this to the change in the air brought in by Vianne. This angers Father Reynaud more. The rivalry between Reynaud and Vianne intensifies when a group of gypsies led by Roux sets camp on the river bed. While most of the village boycotts them, Vianne welcomes them with open arms. Armande supports her and hires Roux to do small tasks for her around the house. Meanwhile Josephine Muscat's husband Paul-Marie harbors hatred for his wife for leaving him and for Vianne for taking her in after brain washing his wife. He joins Reynaud in trying to destroy Vianne and her chocolaterie. Will they succeed? Chocolat is a very simple story, but its brilliance lies in the story telling. Every character gets his/her share of attention and chocolate gets more than enough of it. The plot is simple - Temptation vs Church which means Vianne vs Reynaud. Their face-offs are written with much thought and they come out really well. Especially Vianne's confidence and her brilliant cooking skills. I also liked Vianne's back story where she traveled a lot with her mother from city to city running away from the Black Man. This is her secret, but how much of it makes sense? To Vianne as well as to the reader? I wasn't very clear on this part. Reynaud's secret made total sense even though it was hard to believe that he held on to the sanctity of the church even after what he had witnessed. Armande is so delightful and lively that you want to be like her when you grow old. The character of Roux was extremely intriguing although he doesn't say much. There seemed to be a definite connection between him and Josephine at first, but what happens towards the end really shook me. I would have liked to know more about him. What he thought? And whom did he actually like? Will there be a future for him and the woman he sleeps with? The author also talks about a baby coming out of this, what about the child? Also, how can one be so sure that there will be a baby? A girl at that? Apart from these few questions, the book is a very nice read. It tempts you to go straight to that block of chocolate in your fridge every time Vianne tempers or pours chocolate over a filling or into a glass. Chocolate enjoys its importance throughout the book and that is the main purpose of the book after all. Verdict: This makes for an excellent breezy read. Plus, it is a bonus if you love chocolate. Haven't read the book. But the movie is beautiful! I need to watch the movie too. Oh do read this ASAP. I have never heard of this one 😱 but I really liked the storyline... This sounds like a very intriguing book... Chocolate vs church. Love your indepth review. Will look for it in bookstore. Oh you should read this. Must admit I haven't watched the movie or read the book. Sounds interesting though. Wow Sowmya, .. Now thats quite a good rating. I havent watched the movie either, and would prefer reading the book first. on my TBR now! In that case, read it soon. I have neither read the book, nor watched the movie. Your review has made me add it in my TBR list. Hope to read it sometimes soon! I hope you enjoy it as much as I did, Shilpa. They changed the ending big time in the movie. To be honest, I prefer the movie's ending - they give her a softer, forgiving side, which is different from the book character. But the book set the tone for its sequel, that the movie didn't. Oh they did? I did not like the way this ended. Maybe yeah it had to pave way for the sequel. Let me watch the movie then. I remember watching the movie and drooling over the chocolate and Johnny Depp simultaneously. You have tempted me to read the book now after your excellent and descriptive review. Thanks! Oh I cannot wait to watch the movie now! Armande is such a brilliant character! And the description of all the hot chocolate pots, and the preparation for the Easter Festival made me crave chocolate like an addict! I read Chocolat after looking at it on your GoodReads update, and seeing that so many people had read Chocolat already! 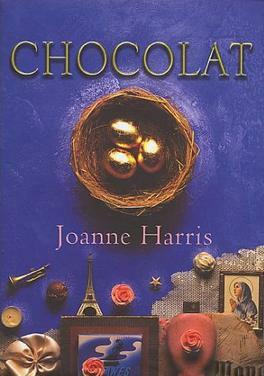 I have the next in series 'Blackberry Wine' and 'Lollipop Shoes', which I will read along with Chocolat again in May! Let me get the other two books rightaway! I loved reading the book! And yes I was craving for chocolate all the time when I was reading the book! 4 Stars! When I saw the post title I wondered if it had something to do with the movie. I've neither read the book nor seen the movie, but after Sreesha's comment, am tempted to do both! Nice review! Hugs, Soumya! Chocolate is simply amazing, its the whole experience, not just the flavour that gets you immersed in the taste of the dessert. Yum! chocolate, I simply can't live without it. Definitely! Have you read the book? Watched the movie, loved Depp and fell in love with chocolate all over again. I'd like to read the book some day. Something about books no? That movies can never equal. I will look out for the movie.